Many are confused between the usage of shrimps and prawns when in reality both terms are often used to describe the same kind of animal. Macrobrachium rosenbergii or popularly known as the giant freshwater prawn are famous for its breeding program. 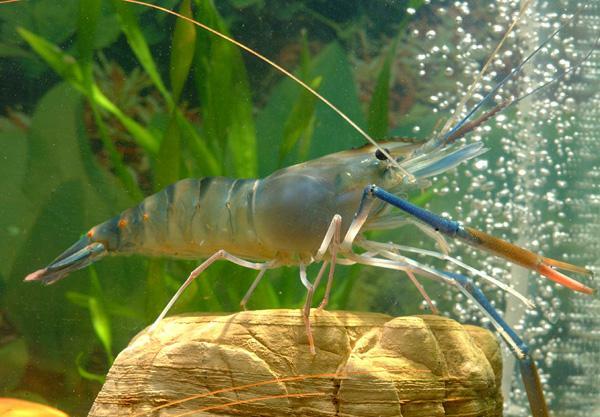 Recently, the growth of freshwater prawn farms has increased tremendously. Over 37 countries are practicing the freshwater prawns farming and although it may not succeed commercially, demands for Macrobrachium rosenbergii are very high because of the food value. To breed Macrobrachium rosenbergii takes a long time and a lot of hard work even though it does not require much attention as other aquaculture creatures. Although Macrobrachium rosenbergii lives in freshwater habitat, during its larval period, these type of prawns grow in brackish water, water that has more salinity than fresh water but not as much as salt water. 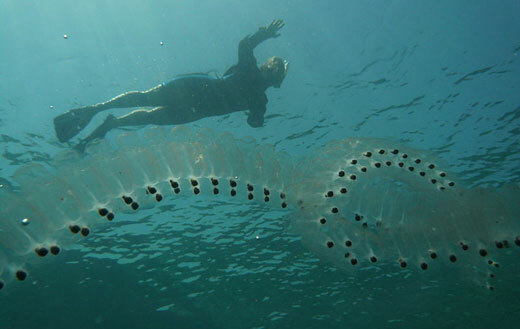 Once it has grown out of its planktonic stage, it will continue to live entirely in freshwater areas. The growth of Macrobrachium rosenbergii begins when the male prawn spermotophores the female thorax where the female prawn will extrude eggs to be fertilize. Once the eggs are fertilized, the female prawn will carry the eggs until they hatches into zoeae. After going through several larval stages, these zoeae will metamorphose into postlarvae. At this stage, they will be around 8 millimeters in length with all the adult characteristic. They process will take over a month after the eggs have hatched. These postlarvae will then migrate back to the freshwater area to grow into adult prawns. There are three stages of growth for the male Macrobrachium rosenbergii. The first is called the ‘small male’ where it is clearly identified with its translucent claws and its short body in length. The second stage is known as the ‘orange claw’ stage in which the ‘small male’ will develop orange colored claws and will grow bigger in length. At this stage, the prawns will grow up to 1.4 times of its length before. The third and final stage is the ‘blue claw’ stage. This is the stage when the prawns are fully matured. Identifying them is fairly easy as they have blue colored claws and in total about approximately 12 inches in length. There has been an occurrence where the male species have grown over 32 centimeters which is over 12 inches in length. However, it is a different for the female which may only grow over 25 centimeters long. In all three stages, the males are sexually active and the female will cooperate in order to reproduce. The ‘blue claw’ males will protect female prawns until their shell is hardened in which a behavior that neither the ‘orange claw’ nor the ‘small male’ prawns have shown. 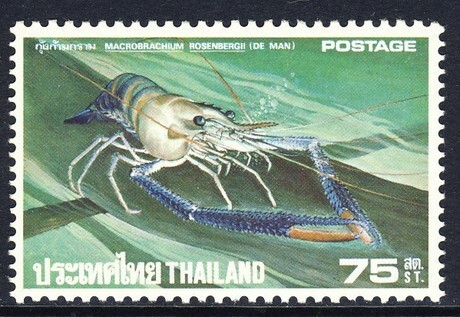 The Macrobrachium Rosenbergii is so important, it made it onto a stamp! Raising these freshwater giant prawns is no joke but compare to other aquaculture breeding, farming these creatures are fairly easy. This type of prawns can be bred in outdoor ponds. With the success of the modern technology, sales of Macrobrachium rosenbergii can be found online as well.